More people each year are discovering one of our nation’s most unique and diverse resort destinations – Lake Havasu City, Arizona. Few locations can boast a variety of vacation activities vast enough to appeal equally to so many different types of vacationers. From lake-bound families to romantic couples and eco-tourists, visitors will find what they’re looking for at Lake Havasu. Nestled amidst rugged desert peaks on the crystal blue Colorado River, Lake Havasu City is an extraordinary convergence of desert ecology, breathtaking shoreline and small town charm. Lake Havasu’s unparalleled mix of distinct topography and spring temperatures in the 70s – 90s provides visitors safe and easy access to a wealth of outdoor activities. A Native American term meaning “blue water,” “Havasu” is an apt name for this beautiful lake created by the construction of Parker Dam in 1938. Lake Havasu’s 45 miles of wide-open areas, unlimited sunshine and secluded beaches and coves offer water sports enthusiasts ideal conditions for virtually any type of water-bound recreation imaginable. Visitors enjoy a wealth of activities including swimming, boating, kayaking, canoeing, water skiing, sailing, and riding personal watercraft. Dubbed the “Personal Watercraft Capital of the World,” Lake Havasu is a hot spot for both novice and professional personal watercraft enthusiasts. Each year since 1982, Lake Havasu hosts the world’s top personal watercraft racers for the Skat-Trak Watercross World Championships. This thrilling week of racing features competitors from over 40 U.S. states and nearly 35 nations, and draws nearly 40,000 spectators. For those who prefer a more relaxed water-based alternative, fishing, paddle boating, canoeing and kayaking are available, all of which allow visitors ample time and a more intimate opportunity to enjoy the sun and spectacular scenery. Kayak and canoe trips in Topock Gorge amidst the Havasu National Wildlife Refuge offer visitors a unique perspective of one of the lower Colorado River’s last pristine stretches. Trips through the Gorge via London Bridge Watercraft Tours (928-855-7171) or Western Arizona Canoe and Kayak Outfitters (WACKO) (928-855-6414) offer visitors the opportunity for a first-hand glimpse of an amazing array of waterfowl, wild burros, and desert bighorn sheep in their natural habitats. Many take advantage of the plentiful and diverse shoreline of the Colorado River by renting a boat, packing a cooler, and enjoying the solitude of Lake Havasu’s many private coves, beaches and boat-in campsites. Whether looking for a day of family fun in the sun or an evening of romantic solitude, visitors are sure to find it along Lake Havasu’s 450 miles of shoreline. Many Lake Havasu merchants make water adventures easy by renting all the equipment guests need right on the lake by the hour, half day, or full day. Those wishing to tackle fresh water fishing opportunities in Lake Havasu will find an abundance of striper, largemouth bass, black crappie, bluegill, and rainbow trout. Hosting the largest freshwater fisheries program of its kind in the United States – a 10-year, $28 million project – Lake Havasu is quickly becoming a Mecca for the nation’s angling community. In addition to April’s annual Charity Pro-Am Fishing Tournament, Lake Havasu hosts the Western Outdoor News Striper Derby in June, and many other smaller tournaments throughout the year. Locals consistently rave about the size and quantity of Lake Havasu’s Striper and widespread return of the lake’s sizeable largemouth bass. In addition to countless water-related activities, Lake Havasu City offers tennis, golf at four public courses, hiking, rock climbing, and mountain biking. Those on the adventurous side can enjoy off-road jeep tours, hiking adventures or supervised climbs in Havasu’s Outback, the nearby Sonoran Desert and Mohave Mountains. For a unique perspective on Lake Havasu’s rich Native American heritage, many visit the Creative Cultural Center. The Center provides an outdoor setting for an entertaining and educational Native American experience in which artisans market authentic products, present informative lectures, tell stories of their past and present, demonstrate ancient art forms, sing, dance, and conduct hands-on craft activities. Equipped with a natural desert stage, sound system, patio dining, fire pit and display walls, the Center is the perfect place to explore Lake Havasu’s native history. Lake Havasu City’s most popular man-made attraction is the world-famous London Bridge. Purchased for $2,460,000 by city founder Robert McCulloch, the famous span of England’s River Thames was relocated to its Lake Havasu home in 1968. Since it’s completion and dedication in Lake Havasu City in 1971, London Bridge has been one of Arizona’s premier tourist attractions drawing thousands of visitors each year to its classic architecture and WWII strafing marks. It has also created a classic backdrop for countless Lake Havasu weddings and romantic sunset strolls. The surrounding English Village features a wide variety of Tudor style shops and boutiques along Bridgewater Channel offering something for everyone. Lodging options are numerous in Lake Havasu City, including resorts, inns, hotels, motels, condominiums, houseboats, campsites, and RV parks. Those looking for a unique “London in Arizona” experience will enjoy a stay at the London Bridge Resort. Situated next to the English Village in the shadow of the world-famous London Bridge, the London Bridge Resort is a favorite of those who enjoy spacious Jacuzzi rooms and an ideal location on Havasu’s active Bridgewater Channel. Having undergone a $7 million renovation, the Nautical Inn is Havasu’s premier water sports resort destination. The only resort in Arizona featuring all waterfront suites, the Nautical’s private cove and easy marina access are ideal for those wishing to enjoy the lake. Rent a wide variety of watercraft from the Nautical’s convenient beachfront water sports rental center, dine with a beautiful view of the city from the Captain’s Table restaurant, or enjoy a stellar Havasu sunset from your private deck overlooking the lake. 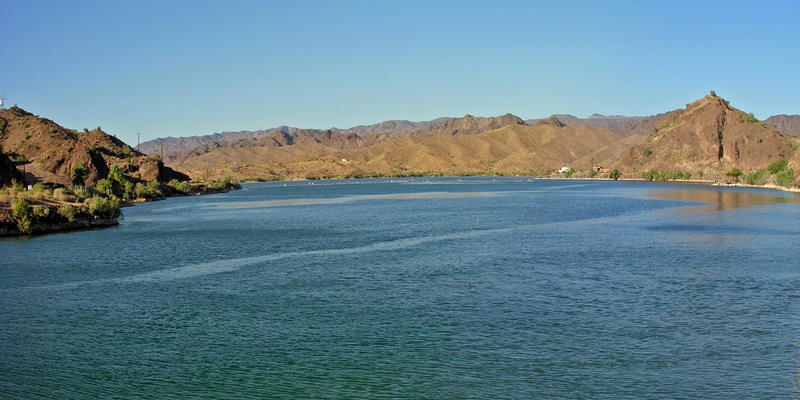 Only 5 hours from Los Angeles, CA, 3 hours from Phoenix, AZ and 2.5 hours from Las Vegas, NV, Lake Havasu offers the region’s growing number of road-minded vacationers and boating enthusiasts a full service resort destination they can drive to – without confronting crowds, high prices and a lack of lakeside amenities. “New visitors are always pleasantly surprised to realize how much we have to offer here,” explains Bonnie Barsness, president of the Lake Havasu Tourism Bureau.